When defending a shot gun spread option offense that has both a run and pass threat, you need to apply enough pressure to 're-position' the line of scrimmage (LOS) against the run and at the same time, have solid pass coverage versus the pass. 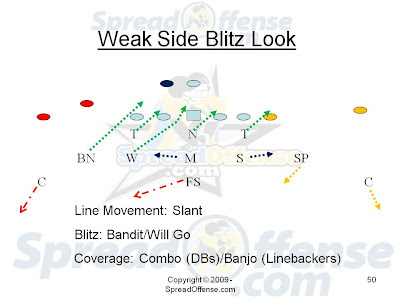 One blitz package that can help do both is a weak side blitz (we're calling the twins formation the 'weak side' as opposed to the tight end side the "strong side", even though the off-set running back is positioned to the twins side [in effect causing a trips look], which some coaches would call the strong side). 'Slant' call for the 3 down lineman, meaning they are slanting into the strong side gaps (slant = 'strong', or to strength, and angle call = away from strength, or 'weak'). Slant and Angle stunts are gap philosophy techniques to try and cause penetration and disturb normal blocking tracks of the offensive line, thus dictating movement at the line of scrimmage. 'Bandit/Will Go', a 'controlled' blitz from the two weak side linebackers that want to try and time the snap so they have forward momentum. I use the word 'controlled' because based on the down and distance of the play at hand, this could either be a run blitz or a pass blitz, and the last thing you want to do is run by a run play because you blitzed 'out of control'. This is a critical coaching point, especially at the young levels, being able to teach defensive players how to blitz 'under control' based on the down and distance and more importantly, the real time read of the play... pass or run. A blitzer is useless if they run themselves past an inside run play (especially to their side) or a mobile quarterback on a pass. Combo (DBs) and Banjo (LBs), these are specific unit combination coverages that tell two defenders that they're responsible as a 'unit' for either one or two defenders in coverage. In the case of the 'Combo' call above, the left Corner (C) and Free Safety (FS) are responsible for the 'X/SE' and 'Z' in the twins formation to the left. This means that they're playing a 'zone-man' of sorts based on who enters their 'quarter' of the field... but it's not a true 'zone', because once engaged or committed, that man is yours even if he crosses the entire field in this case, the X/SE may do this on a crossing route, so the FS would be responsible for that (if they both cross, aka 'cross/follow', then both defenders will follow)... plus the 'Mike (M) and/or Sam (S)' could wall-off on any crosser's IF the running back stays in to block [see below]). The combo on the other side of the field is the Spur (SP) and right Corner (C) with the Tight End (Y) and Flanker (FL). Again, same principles as the combo to the other side as far as responsibilities in coverage. The Banjo call is directed to the Mike (M) and Sam (S) who are working as a unit to cover the Running Back in the backfield should he release right, left, or up the middle for a pass or screen. You sometimes hear a 'Banjo... Banjo' call and then see the Mike backer point to the running back and then yell to the Sam (or Will backer on occasions, based on the defense) backer in games on TV. If you notice the gap responsibilities versus the run game, you see the Mike is 'free'd up' to key ball flow - meaning he has no assigned gap responsibility versus the run... a nice aspect to this package. Note: A play that can pose a 'challenge' to the defense in this package and call is the 'bubble or jailbreak' screen, more the bubble with the Bandit blitzing 'assuming' he can't disrupt the play. The Free Safety and Mike really have to hustle to get to the perimeter to support the Corner. That's the 'chess match' that makes this all fun! Hopefully this package is something you can use in defending the spread offense. Keep spreading u'm (or defending u'm)!